The great helm was great for a number of reasons, but none as important as the level of protection it provided to the warrior who wore it. This Knights Helmet is a classic example of a medieval great helm that kept is wearer safe behind layers of steel. This helmet is very much a typical great helmet, as it encapsulates the wearers head on a barrel-shaped layer of steel, which provides quite the impressive level of protection. This helmet has a flattened top with riveted reinforcements along the helms upper ridge, while also featuring a decorative polished brass cross on the helmets face. This cross rests right over the helms eyelets, which are narrow cut-outs that nevertheless still allow the wearer to see out. Small vertical cut-outs along the lower section of the helm, on either side of the cross, provide ventilation to the helm and make it easier for the wearer to breathe while wearing the helm, thus circumventing one of the main issues with a full helm like this. The helmet is made from high quality metals, including steel and brass. 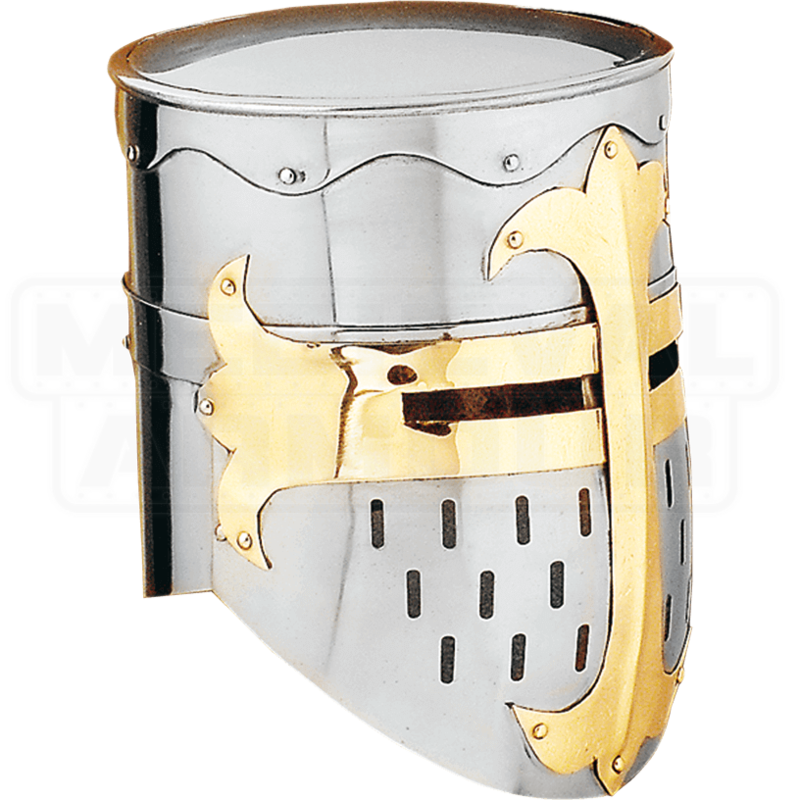 It is not only a perfect piece of armor to wear when you are getting ready for a reenactment battle, but this Knights Helmet is also a great piece of medieval armor to display as a part of your own collection of historic arms and armor.